Did Buick Just Accidentally Leak The Camaro-Powered V6 Regal GS? Our dreams of a fun and powerful wagon or Sportback may just come true after all. Thanks to a keen eye, The Truth About Cars has found evidence that Buick’s dynamic five-door duo will soon get a lot more dynamic thanks to the addition of an engine from elsewhere in the GM lineup. While the prospect of a Buick-badged wagon and a Sportback model is exciting, possibly signifying that more wagons will make it to the US if automakers find them viable, the 2.0-liter turbocharged four-cylinder under the hood leaves a bit to be desired. 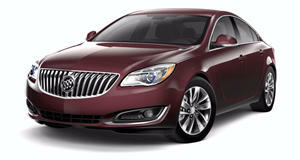 However, Buick’s Canadian website slipped up and leaked important information regarding a power upgrade. Before the message disappeared from the site, Buick Canada's webpage referenced a more powerful Buick GS model, saying, “The driver’s car you can't wait to drive. Engineered to make getting there all the fun, the all-new Regal’s excellent driving performance is something to be experienced with available new powertrain and AWD system (3.6-liter V6 on GS and Twin Clutch AWD)." When the Regal was first announced, there was absolutely no mention about any other model, only a word or two about four trims available for the Sportback model and three for the Tour X. Prospective buyers and fans could at least find solace in the fact that the standard Regal would carry 250 horsepower under the hood, only 9 fewer than the 2017 Buick Regal GS and a full 68 less than the base Regal currently on sale. For the time being, GM has only cleared the first hurdle by announcing the 2018 Regal and its fall 2017 on-sale date, but it has time to add new engines into the mix. If Buick did borrow a 3.6-liter V6 from the General, it could come from any number of other GM applications, including the V6 Chevrolet Camaro. There it makes a punchy 335 horsepower and rockets from 0-60 mph in 5.6 seconds, although the engine is detuned to make 305 horsepower in other GM vehicles. If the Camaro's power plant makes it to the Regal GS, an all-wheel drive system that can be had across the board (and hopefully on the V6 Regal), would certainly help on the acceleration front and make the Regal pair a fun one to be in. Let’s just hope the suspension system gets a tune to match the performance upgrade. Buick returns to its high-performance roots with the 2012 Regal GS, but is it good enough to carry on the legacy of the famed Grand National? European quality and styling in with an American badge makes for a good mid-size sedan.